DOLETA reports 414,657 actual unemployment claims for the week ending April 3, and puts that at 460,000 seasonally adjusted, an increase of 18,000 from the prior week. The media spin on this is negative. BUT… As shown below, this is actually a very favorable weekly claims report. Last week the claims number was 41% of the way up from the low values of 2006-2007 to the high value of 2009 *for this week*; this week it is only 31% of the way up. 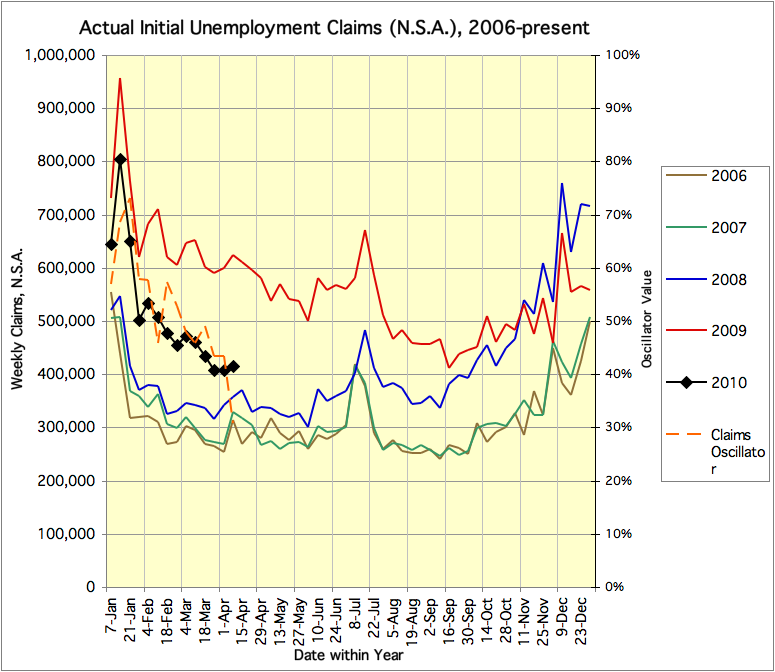 The claims data continue to trend towards the “healthy” market level. I do not know where the Department of Labor gets its seasonal adjustment factors from, but the fact is that there was a surge in claims during this time of year (an increase of about 30,000, generally this exact week, sometimes 1 week earlier) in each of the past 4 years. Their seasonal adjustment factor doesn’t seem to be filtering that out correctly. I think the chart above is pretty clear and doesn’t need much media obfuscation! This entry was posted on Thursday, April 8th, 2010 at 05:03 and is filed under UE Claims. You can follow any responses to this entry through the RSS 2.0 feed. Both comments and pings are currently closed.